GET RID OF BULKY BATTERY- FAST HEAT within 3 seconds.USB plug compatible with most power bank in the market with output 5V/2A( BATTERY NOT INCLUDED ); NO RADIATION- high-end heated material enables quick smooth electric warmth without radiation. RELIEVE PHYSICAL STRESS: Suitable for varieties of occupation who always stand or sit a long time feels fatigue or shoulder pain in the office. This heated vest has three heating zone on the back not only just keep your body warm in winter but also can to help promote blood circulation relieves sore shoulders. ONE BUTTON CONTROL: Do you wanna a trip without a lot of luggage in winter? Let's say goodbye with thick clothes, this USB vest can save more luggage space. We have 5 intelligent heating levels. The first level(30℃) -suitable for indoor, the second level(35℃)-suitable to work, the third level(40℃)-suitable for camping climbing, the fourth level(45℃)-skiing、hiking、snowmobile, the fifth level(50℃) -Photography. 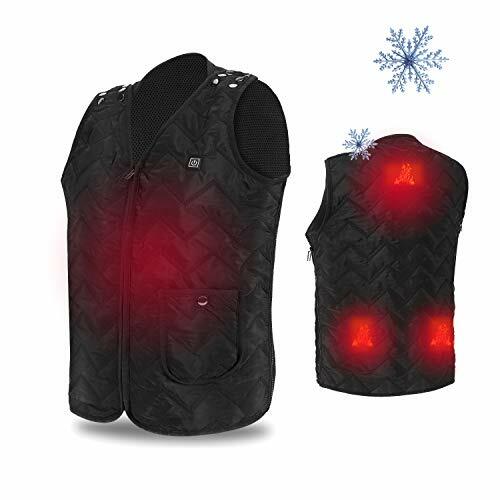 SIZE ADJUSTABLE & AWAY FROM BLOATED:This heated vest has 4 sizes (M-XXL) can be adjusted on the side. Classic-black is easy to match clothes fashion Accessories or shoes to keep you away from bloated. WARRANTY &CARE：Machine washable/dry-cleaning/hand wash. One year warranty.To make sure this heated body warmer vest can be used normally please use our detector to test power bank you can know whether this power bank is 5V/2A. If there is any problem please feel free to contact us at any time, we will give you a satisfactory reply as soon as possible!.